We are happy that you and your son are interested in our troop to start his Boy Scouting adventure! 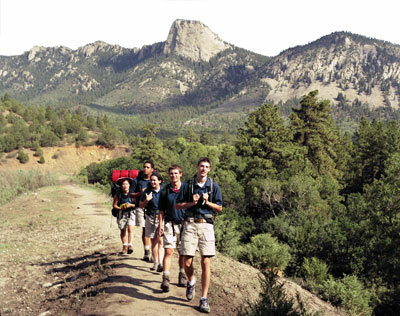 Troop 1097 was founded in 1963 to provide boys with a chance to develop moral strength and character, participating citizenship, and physical, mental, and emotional fitness in the context of an active outdoor program. The Troop is based on fundamental Scout skills and traditions, an active and challenging outdoors program, and leadership development and advancement. We operate on the premise that it is the outdoor activities that attract boys to Scouting, and not the indoor Troop meetings. Regular outdoor activities “fuel” meaningful indoor programs as Scouts prepare to go outdoors. We are chartered by the Izaak Walton League of America (IWLA), Rockville Chapter. While we cooperate closely with the League, and do all that we can to support its activities and facilities, membership in the League is not a prerequisite to joining the Troop. 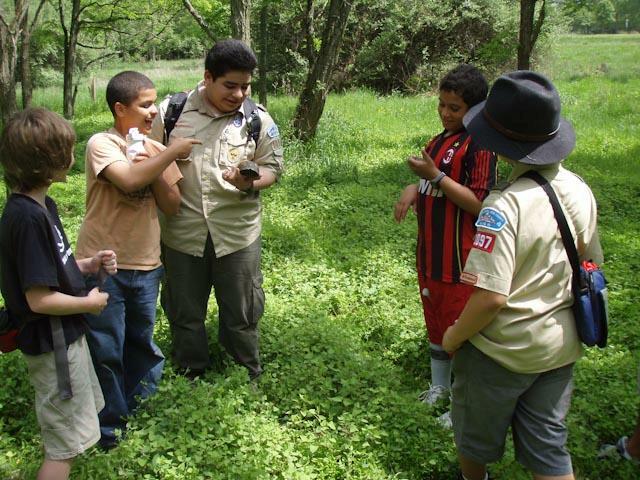 The Scouts elected to lead the Troop (the Patrol Leaders Council) plan at least one outdoor activity per month. 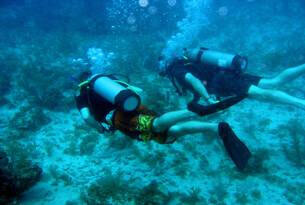 There is a camping activity most months. In addition, the Troop attends at least one week of summer camp each year and experienced Scouts have an opportunity to participate in a High Adventure program. Weekend campouts, Summer camp at Camp Liberty, Gaithersburg Labor Day Parade, Eagle Projects, Antietam Illumination Service Project & Campout, Klondike Derby, Whitetail skiing, Rodney Reservation Camping, caving, and more. Scouts and Adult Leaders from Troop 1097 may choose to participate in the Boy Scouts of America local and national High Adventure programs. Scouts must have earned their First Class rank, and be at least 13 or 14 years of age, depending on the program. Philmont, Florida Sea Base, Northern Tier, Lenhok'sin and the new Summit Bechtel Reserve in West Virginia are the main High Adventure programs we attend. Boy Scout Class “A” Uniform (Shirt, purple World Crest emblem, Council Patch, and Belt) – available at the Scout Store. “Experienced” uniforms may also be available from time to time from the Troop’s uniform person. Most boys opt for the short-sleeved shirt to get the most out of it during warmer months. 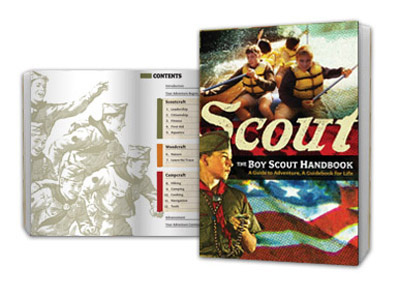 Boy Scout Handbook and Sash for merit badges– also available at the Scout Store. The Troop will supply the “1097” numerals, green Shoulder Epaulets and neckerchief & slide when your Scout first joins the Troop. Class “B” T-shirt – For the summer meetings/outings. One or more can be purchased from the troop through the Troop’s uniform person. Since we begin wearing these at the end of the school year, you can also expect to be able to purchase them at our Family Picnic/Spring Court of Honor. The Troop provides most of the required camping gear with the exception of a sleeping bag, and a mess kit. For early campouts, 2-3 blankets can serve very nicely in place of a bag. 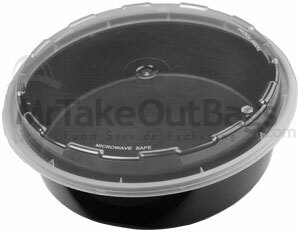 A plate (take-out chinese container is perfect), plastic spoon and large mug make a fine mess kit. 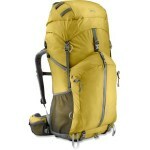 Most scouts also prefer to have their own packs, although the troop does have some on hand. Lastly, no Scout is allowed to carry or use a knife, ax or saw at any Scout activity until he has passed the requirements for the Totin’ Chip. He can achieve this requirement during the first couple of camp-outs. After that he may carry a pocketknife.